Birds are beautiful creatures. Their colorful plumage and quirky personalities can captivate us in the blink of an eye and easily tempt even the staunchest of skeptics into pet ownership. But birds are more than beautiful. They are emotional, intelligent creatures with needs few consider before making the leap into bird ownership. Like all pets, a bird should never be an impulse buy. Birds require a level of care that, unfortunately, many would-be bird owners never consider prior to taking the plunge. We cannot encourage you enough to research the specific needs of the bird you are looking to adopt and be certain that you can provide your bird with the life he or she deserves. Birds are very clever animals and can become easily bored if their needs are not met. For a bird to thrive as a pet, he or she needs to receive the same love and attention you would give any animal member of your family. Birds need time and interaction with their humans, as well as an enriching environment and plenty of training to keep them stimulated since they can become bored and depressed. To keep your pretty bird happy, be sure it has the proper size cage. You’ll want to find something that is big enough for it to move (and fly) around in and have some fun. Provide your bird a variety of perches, ranging from high to low and public to private. Likewise, providing your bird with plenty of games and toys to explore and play with (both in and out of the cage) will keep your bird happy as well. And, of course, be certain to keep your bird’s cage clean and free from droppings. Birds take pride in their appearance and environment. A messy cage means an unhappy bird. Contrary to popular belief, there is no such thing as a balanced seed diet for birds. Much like us, if you give a bird a plate of food it is always going to be the bird’s instinct to pick and choose his or her favorite bits out and leave the rest. Unfortunately (and not surprisingly), it’s common for the bird to pick out the “candy seeds,” and leave the nutritional seeds as refuse. For this reason it is advised that your bird should be eating a formulated, pelleted diet (similar in consistency to dog and cat foods) that will ensure he or she is receiving all the nutrients required of a longer and healthier life. Aside from meeting your bird’s emotional and intellectual needs, it’s important to know your bird’s personality as well. Life span. Birds have long life spans. Parrots, for instance, can live 30 to 90 years depending on their size and type. Designate a willing future owner should something happen to you. Flight. Birds do fly away when given the opportunity. An open window and untrimmed wings up the odds of never seeing your pet bird again. Be diligent. If you have any questions about your bird’s health or behavior, or would have any questions about bird ownership you would like to discuss prior to adoption, please don’t hesitate to contact us. 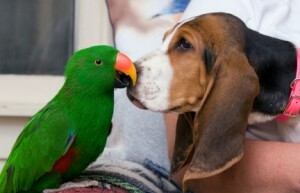 We would be more than happy to schedule you and your pet an appointment or answer any questions you may have. Do you have any feral in your area? It’s likely you do. A feral cat is one that is born and raised in the wild, or has become wild in order to survive after being abandoned or lost. These cats are often too scared to be handled by humans and often live in groups called colonies. 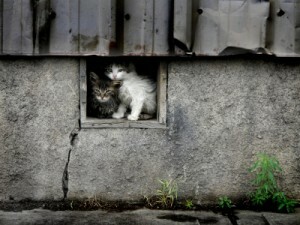 Sadly, life is not easy for these cats, and most do not live to be older than 2 years. Some colonies are lucky enough to have a caretaker in their neighborhood that helps to provide them with food and fresh water, and a safe, outdoor shelter in extreme weather. With the help of these caretakers, many feral cats may live longer than two years. Still, it’s a hard life for the feral cat. Give them shelter. A discreet enclosure in a quiet location can provide a sheltered area for kitties to huddle away from the elements. Insulating the shelter with straw or elevating it off of the ground also helps to conserve heat or keep the shelter cool in the summer months. Provide food and water. Regardless of the time of year, all animals need food and water. During summer months, the simple act of keeping an accessible bowl of fresh water is a kindness that will not go unrewarded. Likewise, cats need calories, particularly if they are trying to stay warm in the winter months. Feeding outdoor pets (feral or otherwise) on a regular schedule enables them to know when to expect their meal, and allows them indulge before the food and water has a chance to freeze or spoil. Consider providing a feeding station that has a roof and sides to protect feeding felines from the elements. Be on the look out. Always tap your hood and check under your car before starting it in the winter to be sure that there are no cats in harm’s way. Keep antifreeze out of reach and clean up spills or leaks immediately. This lethal substance is very tasty to cats as well as other animals. Unfortunately, many communities attempt to use outdated methods to deal with cat colonies, including lethal elimination or relocations. Not only are these methods cruel, but they are also ineffective. Currently, Trap-Neuter-Release (TNR) is the only method of population control endorsed by the ASPCA. This method involves trapping the animal in order to provide them with both vaccinations and a spay or neutering procedure, and then releasing the animal back into “the wild.” Not only does this technique help to curb population growth, but it also stops nuisance behaviors such as spraying and fighting, as well as the spread of diseases. Likewise, it also prevents shelters from becoming overrun with feral cats, which are often not ideal candidates for adoption. If you find that your neighborhood has become home to a feral colony, do not contact your local humane shelter. Often, local shelters are not equipped with a TNR program, and instead just euthanize the animals. Contact Feral Fixers or CatVando for assistance. These organizations will do what it takes to help these cats live a safe, healthy, and reproductive-free life. We hear all about keeping dogs out of the heat, out of parked cars, and in the shade during the hot summer weather. But what about our feline friends? Summertime can be hazardous for cats as well. • Cats can get heat stroke also. Outdoor cats are at highest risk (consider keeping cats indoors on the hottest days), but indoor cats are only safe when the house is kept cool. Don’t turn off your air conditioning during the day, and if you are going to be out of town make sure someone is checking in on your cat and ensuring the house is at a safe temperature. If your cat does go outdoors, be sure that they have access to fresh, clean water at all times. Elderly, or sick cats are at the highest risk of succumbing to the heat. • Summer means lots of critters are out and about besides your cat. Increases in the number of cat fights and animal encounters are seen during these months. 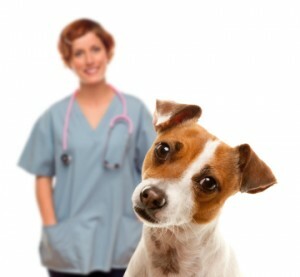 Be sure that your pets are up to date on their vaccines. Spaying or neutering your cat can decrease the number of these incidents. Declawed cats should never be intentionally left outdoors. • There is an increase in the number of parasites that are lurking about in the summer. Fleas love to hang out in cool, shady areas where your cat will likely be. Heartworms, which are transmitted by mosquitoes, are also a summer risk for cats. Make sure your cat is on a quality parasite prevention program. • Some summertime hazards are impossible to avoid for an outdoor cat. You cannot eliminate the risk of exposure to chemicals such as rat poison, slug bait, or lawn and garden chemicals. Vehicles are also a very real danger for cats. 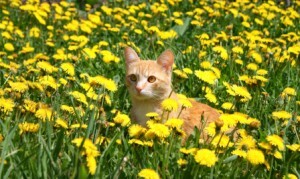 We hope that this summer is a safe, healthy season for you and your cat!